To ask other readers questions about In the Beginning...Was the Command Line, please sign up. This essay is nearly 8 years old, and in dire need of an update. So in 2004 Grant Birkel set out to do just that, producing a set of comments called "The Command Line in 2004". It's freely available on the web, and I suggest you read that version instead of the (older) book. As far as Stephenson's original writing: Wow, what a disappointment. I think Neil Stephenson writes some fun and highly entertaining fiction, and I really enjoyed both Snow Crash and The Diamond Age. However, this was a subje This essay is nearly 8 years old, and in dire need of an update. So in 2004 Grant Birkel set out to do just that, producing a set of comments called "The Command Line in 2004". It's freely available on the web, and I suggest you read that version instead of the (older) book. As far as Stephenson's original writing: Wow, what a disappointment. I think Neil Stephenson writes some fun and highly entertaining fiction, and I really enjoyed both Snow Crash and The Diamond Age. However, this was a subject that needed much more grounding and the essay doesn't have it - it's prone to offer ridiculous analogies, and often ditches the point entirely so it can lament McDonald's expansion into foreign countries and the popularity of the television show Cops outside American borders. Now, this argument doesn't really hold up under close inspection. To provide a simple counter-argument: The command-line itself is an interface, just like the GUI, and the choice of what options to make available is not a factor of whether or not the mouse is an input device but whether or not the feature itself is a worthwhile addition. Linux lets any user contribute a feature that they would find handy, and the commercial world is instead driven by a need to provide more general features that the majority of users might pay for, but one could just as well argue that Linux is building a dull Swiss Army Knife while Windows and MacOS are building very sharp single tools. Like all interfaces there are good and bad design choices, independent of who developed the underlying OS, and that is the real problem. A well-designed interface will offer users a maximum amount of power and flexibility without impeding their ability to get tasks done - if an application is not up to par on this yet, it needs nothing more than simple refinement. This has nothing to do with the OS or GUI environment and everything to do with simple UI choices. However, he's trying to foist this viewpoint onto all users, without allowing them the freedom to choose an OS to suit their own individual needs. It's almost as though he is insulting the users who want their PC to be nothing more than a tool to get their work done - those who like the simplicity of clicking emails in Outlook, who want to use the Start menu because it's fast and easy, or who think the Office paperclip is a handy feature. (Okay just kidding about that last one: nobody really believes that). At times he's suggesting that people are simply ignorant of other operating systems, and if they knew more, they'd pick a "better one". In any case, needing less direct interaction with the PC isn't any indication of a person's general interest in complexity... Perhaps a user of Windows will spend their time tying lures for fly-fishing, though most people would just buy some from the store. We all give up options in some areas of our lives to make time for flexibility in others. Birkel's counterpoint here is especially relevant because he continually points out that the real value of any UI is how much it enhances our ability to accomplish tasks, not how much we can muck things up with it. The last problem with this essay is that it's outdated. Of course there is nothing that can be done about that, though Birkel tried, but many readers would no longer find it so relevant. He also argues that GUIs are for chumps, and if you are really serious about computers you'll be hacking it out at the command line. (To which I say: The command line itself is just another interface, a layer between you and the box, and based entirely on what people have chosen to write for it and how strong their code is.) He asserts that visual iconography isn't as strong, direct, and understandable as the written word. (Which, this one especially: huh?) He points out, with great disdain, how GUIs frame the information you work with in more understandable metaphors and hide complexities from the user. (That's the point, and, when done well, a good thing!) Overall: just sigh. Now, I love Linux. I couldn't live without a CLI. And I liked a few parts of this book. He's a good writer, and is best here when he throws away his pretensions and writes about his struggles with all three of the OSes. I also liked it when he talked about how technology companies work on the basis of temporal arbitrage, which is a great and inspired way to frame the trend in technology to chase after the next big thing. He just misses the point so often here, and is so frustrating and condescending to read, that, in the end, it isn't quite worth it. I read this piece right around when it first came out (on a Palm PDA, no less), and last year when I went back to using Linux part-time I wanted to reread it, because I remembered it fondly. As other reviews here at GR point out, it's very dated and a lot of the criticisms of the GUI don't hold up and may have been off-base even then. Stephenson said in the mid-2000s that the essay needed a completely overhaul but he was unlikely to do it. BeOS is gone, of course, and Linux now has a GUI and com I read this piece right around when it first came out (on a Palm PDA, no less), and last year when I went back to using Linux part-time I wanted to reread it, because I remembered it fondly. As other reviews here at GR point out, it's very dated and a lot of the criticisms of the GUI don't hold up and may have been off-base even then. Stephenson said in the mid-2000s that the essay needed a completely overhaul but he was unlikely to do it. BeOS is gone, of course, and Linux now has a GUI and competes with Windows and Apple's OS in terms of ease of usability in some of its distros. But what's interesting is that some of the essay still resonates, at least it does for me. The conspiracy theory parts and the intellectual condescension are a bit much, but some of the metaphors are great. Windows as a big unwieldy station wagon or ATV (yep, still true), Apple as a sportscar (mostly true although diminishing), and the split between reliance on software and reliance on hardware respectively (still true despite the app store). Also, rereading this at a time when Apple has lot a bunch of value because of flat or declining mobile phone sales and Microsoft is increasing profits through their cloud focus feels a bit like a similar inflection point. I doubt Apple is going under or Microsoft will pull away from the pack, but it's a reminder that these cycles are fast. If you were too young or not paying attention to these battles in the 1990s and early 2000s, or you just want a flavor of what being on the internet was like back in Olden Times, this is still a fun read. But I strongly recommend that you read it here, with Garrett Birkel's annotations. They're from 2004, which is still a long time ago, but they make a great companion to Stephenson's original argument (and Stephenson approved it). Hostility towards Microsoft is not difficult to find on the Net, and it blends two strains: resentful people who feel Microsoft is too powerful, and disdainful people who think it's tacky. This is all strongly reminiscent of the heyday of Communism and Socialism, when the bourgeoisie were hated from both ends: by the proles, because they had all the money, and by the intelligentsia, because of their tendency to spend it on lawn ornaments. ItBWtCL is a pithy, casually-but-astutely observed essay on the (then-)current state of the desktop computer market and how we got there. Like a really good blog, but one that doesn't strain your eyes and has great typesetting, it's more about coming to familiarize yourself with the author's peculiar voice and perspective of the world than it is a properly historical, or even editorial, work. Drifting from topic to topic with plenty of detours, it's a work that only got properly published because of Stephenson's guaranteed audience; still, I ended up wolfing it down in a single sitting, so clearly part of me thinks there's something irresistibly compelling about it. I've worked in three separate operating system kernels in my twenty year old career, and find that statement astonishing. Not just because it is completely inaccurate, but because it feels like a weird assertion airlifted in from the lunatic fringe. But just as my eyes are about to start going squeaky-squeak from rolling at the current-at-publication technology discussions, the topic darts to Disney World to discuss interface and cultural influence, and I am enthralled. This is a fifteen year old essay on operating systems that is still interesting, in a few ways. It has some nice ideas about operating systems and information systems in general. Because it's by Stephenson, it's fun, well presented, geeky but well written. And, because it's by Stephenson, it casts some light on things that appear in his (better) novels. He contrasts four operating systems: OSX, Windows, Linux, and BeOS. Of these, he hates the first two, primarily because the GUI takes away the co This is a fifteen year old essay on operating systems that is still interesting, in a few ways. It has some nice ideas about operating systems and information systems in general. Because it's by Stephenson, it's fun, well presented, geeky but well written. And, because it's by Stephenson, it casts some light on things that appear in his (better) novels. He contrasts four operating systems: OSX, Windows, Linux, and BeOS. Of these, he hates the first two, primarily because the GUI takes away the command line interface and makes them too cumbersome to hack elegantly. He loves Linux but recognizes that it's a steep learning curve, and admits that a GUI, while just a metaphor, is a useful metaphor for most people. His pick of the litter is BeOS. Funny then that the BeOS company went out of business and sold to Palm (for just 11 million) only two years later. Palm then caused it's Be subsidiary to sue Microsoft for having tortuously interfered with its business relationships, and Microsoft ultimately settled the suit for 23 million, without admitting liability. So it looks like Stephenson might have been right about BeOS, but that MS, in the endless spirit of "innovation" that it's supporters always talk about, killed the company because they couldn't beat it on technology. He does a great job explaining the implications of having a business selling operating systems. One implication is that the business itself is doomed because operating systems are both free and commonly known, at least to hackers. This caused the symptom of feature creep, in the hope of creating an illusion of value in something that should be free. He thus predicted the downfall of the OS business as king, without claiming to know what development would knock MS from the throne. Turns out it was Google, on the one hand, and the advent of smart phones on the other. There's also a delightful explanation of the Microsoft help system, and the irony of making customers pay, $95 per incident, to help debug Microsoft's own product. This business model was designed to hide how buggy the product was, and to delude people into thinking that the information they got from MS was valuable. In the hacker world of Linux, help was available readily and for free, but assumed a certain amount of technical competence. The further point, that Stephenson did not make, is that most of the businesses that flocked to Microsoft we're already hiring computer experts to handle their systems, and those people could have managed Linux better. So why did MS prevail so long? Stephenson calls it "mindshare". The only monopoly that MS seemed to have was in the collective minds of people who didn't know any better. That sort of monopoly is the most fragile of all. It's the same thing that turns a pop singer into a cultural phenom one week, and makes her a has been in less than a year. Recently finished the e-book version of this; not sure if it was the whole book or the lengthy essay that the book was based on - since I read it on & off over the past few months, I didn't get a good feel for how long it was. It's bit dated (at one point he indicates he is writing a portion in Jan of 1999), but still has some excellent observations on the past, present and future of personal computers, as well as human acceptance of & interaction with computer interfaces. He examines th Recently finished the e-book version of this; not sure if it was the whole book or the lengthy essay that the book was based on - since I read it on & off over the past few months, I didn't get a good feel for how long it was. It's bit dated (at one point he indicates he is writing a portion in Jan of 1999), but still has some excellent observations on the past, present and future of personal computers, as well as human acceptance of & interaction with computer interfaces. He examines the business practices of the main providers of operating systems: Microsoft & Apple, as well as the Linux community and the BeOS group, coming to the conclusion that OS's shouldn't really be a product at all. Sidebars abound: I found the comparison between GUI's & Disney World fascinating, if a bit depressing. This work is chock-full analogies - most are well-thought out and creative. Although it was written by & for techies, I think anyone with an interest in the history & psychology of computing will find In the Beginning... an interesting read. "It is commonly the case with technologies that you can get the best insight about how they work by watching them fail." shades of Donald Norman! "Hostility towards Microsoft is not difficult to find on the Net, and it blends two strains; resentful people who feel Microsoft is too powerful and disdainful people who think it's tacky. This is all strongly reminiscent of the heyday of Communism and Socialism, when the bourgeoisie were hated from both ends; by the proles, because they had all the money and by the intelligentsia, because of their tendency to spend it all on lawn ornaments." Stephenson compares Apple Co. to a commune - noting that many communes, behind the ideals of peace, love & harmony, were actually run by control freaks. He also comments on how many Disney properties came out of books (Pooh, Alice, Peter Pan) & that the originals not only aren't on sale in the parks, but if/when you do come across them, the original books seem weird & like bad knockoffs of the Disney version. I'll agree with the "weirder" - esp in the case of Alice & Peter Pan... but knockoffs? "Disney and Apple/Microsoft are in the same business: short-circuiting laborious, explicit verbal communication with expensively designed interfaces [...:] Disney does mediated experiences better than anyone. If they understood what OSes are and why people use them., they could crush Microsoft in a year or two." "To traditional cultures, especially word-based ones, such as Islam, this [Disney specifically & multiculturalism in general:] is infinitely more threatening than the B-52's ever were. [...:] The ability to make judgements, to believe things, is the entire point of having a culture." Part instructional essay, part political treatise, but ultimately I've got no idea who it's aimed at. It's Neal Stephenson's explanation as to why he believes the command line interface is the 'best' way to interact with a computer. That the GUI is only a metaphor for controlling the computer, a mediated experience that removes too much of both the control and the power that the command line interface allows. Stephenson doesn't go so far (as some reviews have suggested) as pushing for the remova Part instructional essay, part political treatise, but ultimately I've got no idea who it's aimed at. It's Neal Stephenson's explanation as to why he believes the command line interface is the 'best' way to interact with a computer. That the GUI is only a metaphor for controlling the computer, a mediated experience that removes too much of both the control and the power that the command line interface allows. Stephenson doesn't go so far (as some reviews have suggested) as pushing for the removal of the GUI and a complete return to the command line. He believes that the GUI is a useful metaphor for some people and some applications. However, for a power user, the GUI is a broken and mixed metaphor that hasn't lived up to it's promise. The two major problems though, are firstly, complaining about a metaphor using another metaphor to do so, while ignoring the fact that the command line interface is also a metaphor (just an older one that is potentially less mixed and broken, but no less a metaphor) is just too many metaphors too many. And secondly, that the essay has no real audience. Either readers are 'trapped' in their GUI mediated experience but are unlikely to read this, understand it, or care. Or readers are already convinced that the command line can be a more elegant solution to many problems but still aren't quite sure what the point of the essay actually is. Fantastic essay about Unix, Windows, Mac, the ethos of open source, construction, cars, and much, much more. It's 20 years old at this point so some stuff is out of date, but I was amazed at how much still holds true, and how good of an intro guide to Unix it is for beginners. I think everything getting started with CLI should read this book. Stephenson is a master of making the technical accessible through elaborate analogy. Neal Stephenson, a guy with no small degree of technical knowledge when it comes to computers, published this essay/book in 1999, at a time when the Internet was old but the World Wide Web was new (and changing everything), and when Apple was having its second Steve Jobs halcyon, on the verge of launching iTunes, the iPod, and creating the kind of retail tsunami from what Stephenson would derisively call "hermetically sealed" operations systems. And for all this, what we get from "In the Beginnin Neal Stephenson, a guy with no small degree of technical knowledge when it comes to computers, published this essay/book in 1999, at a time when the Internet was old but the World Wide Web was new (and changing everything), and when Apple was having its second Steve Jobs halcyon, on the verge of launching iTunes, the iPod, and creating the kind of retail tsunami from what Stephenson would derisively call "hermetically sealed" operations systems. And for all this, what we get from "In the Beginning...Was the Command Line" is a wandering manifesto from a guy who disdains Windows, had his heart broken by Mac (after a disastrous hard drive crash) and fell in love with Unix so hard that you kind of wonder why he doesn't just marry it. The worst part is that throughout this book< Stepehenson shows himself not as a knowledgeable tech guy with the inside track on a great alternative to the two big OSs on the market. Rather, he comes off as a guy who is merely pining for the good old days when computers were arcane, required guys who were both wizards and mechanics to make them run properly, and who enjoyed a goodly deal of power from all that. And if not power, at least the smug self-satisfaction in knowing that the whole world ran on machines that needed nerds like him to keep in proper order. And you get that maybe Stephenson senses what is coming, and this is his last, spasmic love letter to a tradition wherein the only real way to use your computer, the only way that is respectable, the only way that doesn't just reduce you to some kind of simpering prole, is to know how to write code from the ground up. And since Windows and Mac doesn't really allow you to do that as openly as a guy like Stephenson might want, Unix in general, and Linux in particular, has become the One True Way. Too bad the rest of you confused children just don't see it yet, his book seems to say, and it both pats us on the head for not getting the message while simultaneously spitting in our Starbucks for being too stupid to care. After a while, you get the feeling that if you're going to endure this level of sly condescension, you might as well hang out at a comic shop or something. This ridiculous collection of interrelated essays by Neal Stephenson manages to be both dated and contemporary, depending on whether you're still ranting about the advance of computer operating systems, or you've accepted the inevitable but are frustrated with its intractable failings. 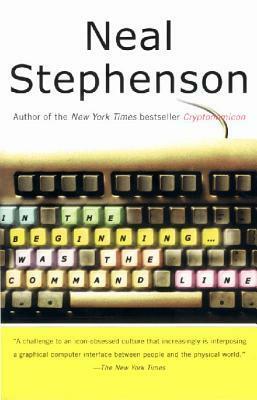 Stephenson wrote this book in 1998 and '99, and in it he rails against Windows and the Mac OS for taking away the power of the DOS prompt and making us all view computers visually. A professional writer, he believe This ridiculous collection of interrelated essays by Neal Stephenson manages to be both dated and contemporary, depending on whether you're still ranting about the advance of computer operating systems, or you've accepted the inevitable but are frustrated with its intractable failings. Stephenson wrote this book in 1998 and '99, and in it he rails against Windows and the Mac OS for taking away the power of the DOS prompt and making us all view computers visually. A professional writer, he believes that written commands are inherently superior to visual control of the computer - and fails to realize that unless you're using 1s and 0s to tell the computer what to do, you're pretty much communicating in metaphors anyways. Instead of these frustrating and flawed graphical user interfaces, the author argues, we should all get turned on to Linux, the free and powerful operating system designed by masses of volunteers. Great idea, except that - as Stephenson himself acknowledges - Linux is HARD to figure out, especially for the novice. The average novice wants to check e-mail, write in a word processor, surf the Web, and delegate the intense stuff to someone else. Even Stephenson admits that Linux is a bit of a bear to use if you're, say, a writer and not a coder. So after gradually building the case for this operating system, he changes allegiances to BeOS. Ironically, Be had already largely been abandoned by its developers by the time this book came out. It was completely dropped in 2001. When I call this book anachronistic or dated, it's because of Stephenson's advocacy for computer systems that were already waning as he wrote, and because of his naive - though still, in some circles, widely held - belief that Linux has any chance of taking hold in the real world. Though I enjoyed the book and found it pretty interesting, it took a fair amount of sifting to get to the tasty bits due to the fact that some of it is outdated and some of it is geeky beyond my interest level. It seems that a lot of readers took Stephenson as a snooty intellectual who thinks you're sort of a moron if you prefer the warm bath of Disney-like interfaces and mediated experiences that filter out what's challenging (and interesting and useful). Because what you should want is the cold Though I enjoyed the book and found it pretty interesting, it took a fair amount of sifting to get to the tasty bits due to the fact that some of it is outdated and some of it is geeky beyond my interest level. It seems that a lot of readers took Stephenson as a snooty intellectual who thinks you're sort of a moron if you prefer the warm bath of Disney-like interfaces and mediated experiences that filter out what's challenging (and interesting and useful). Because what you should want is the cold, angular basement of command line programming where it's real, and no-one puts sugar in their coffee, but you wouldn't (and probably couldn't) understand it. Because you're an Eloi. Yeah, I read about 30 reviews of this book. Can you tell? I disagree, although I did think several times, "but all I want from my computer is to use it as a sort of enhanced entertainment system." Considering how most people use their computers, it may not be worth it to tackle a more demanding interface. Either way, it's worth thinking about the things that filter our experiences, even if some of the specific examples in this book are outdated. I hadn't ever considered my home operating system at all, or that I may be giving up control or flexibility in order to have things laid out in such a tidy way. To quote Stephenson. "What we're really buying is a system of metaphors. And --much more important-- what we're buying into is the underlying assumption that metaphors are a good way to deal with the world." In 1997 or so, I worked for Amazon.com answering customer emails in the call center. We had to learn UNIX commands because Amazon had not yet developed their GUI. It was incredibly flexible and efficient. When they finally rolled out the GUI, none of us wanted to use it. Of course now everything is touch screen, and I sometimes feel like a toddler pointing to what I want. "Ungh!" I say in my caveman grunt, stabbing at the screen with my finger. Poke, poke, poke. I wonder what he thinks of that. Siempre he querido ser un hacker, un nerd de la informática, uno de esos seres privilegiados que son capaces de entender que se oculta tras las lineas de código de un programa. Lamentablemente mi razonamiento lógico es incompatible con la lógica matemática y con la programación. Soy un espectador que juega con los botones del ordenador tratando de sintonizar un canal que emita lo que busco en ese momento. Con el primer ordenador que tuve en mis manos, un Spectrum, descubrí que programar era lento Siempre he querido ser un hacker, un nerd de la informática, uno de esos seres privilegiados que son capaces de entender que se oculta tras las lineas de código de un programa. Lamentablemente mi razonamiento lógico es incompatible con la lógica matemática y con la programación. Soy un espectador que juega con los botones del ordenador tratando de sintonizar un canal que emita lo que busco en ese momento. Con el primer ordenador que tuve en mis manos, un Spectrum, descubrí que programar era lento, aburrido y que te obligaba a estudiar un montón de libros esotéricos que no estaban a mi alcance (literalmente: ni sabía donde conseguirlos ni tenía dinero para comprarlos). Con el segundo disfruté aprendiendo a usar los comandos de MS-DOS, que al menos me permiten imaginar la importancia de la línea de comandos. Con los que siguieron descubrí la comodidad de Windows a cambio de sus cuelgues y reinicios, hasta que tras un fallo desastroso hace unos meses me pasé a Linux. ¿Qué tiene que ver con el libro? Mucho, porque "En el principio fue...la línea de comandos" es la historia de la informática de usuario desde los setenta hasta el año 2000 contada por un programador. Es un libro sencillo, la jerga informática es mínima y solo funciona como ejemplo. Los argumentos que expone son claros y asequibles a cualquiera que sepa encender y apagar un ordenador. I'm not sure if this is interesting but fundamentally dated, or dated but fundamentally interesting. One of the two. I first read this around the time it was published, when it was released for free as a file on Neal Stephenson's web site. This was so long ago that no one used the word "ebook," at least not as a matter of course. I think the book may have been released simultaneously as a dead tree book and as a distribute-for-free file under the GPL or something similar, but the difficulty of fi I'm not sure if this is interesting but fundamentally dated, or dated but fundamentally interesting. One of the two. I first read this around the time it was published, when it was released for free as a file on Neal Stephenson's web site. This was so long ago that no one used the word "ebook," at least not as a matter of course. I think the book may have been released simultaneously as a dead tree book and as a distribute-for-free file under the GPL or something similar, but the difficulty of finding a copy on the web suggests to me that either I am wrong or that Stephenson or one of his business associates decided that they'd rather sell e-versions than give them away for free. I was an undergraduate teaching assistant for a communication course called "Living in the Information Age" when this was first released. I shared it with the other people on the teaching team, and they all loved it. Today I think you may have to be either an extreme geek/nerd to appreciate this, or a technology historian. Operating system and open/closed source wars still matter, but 10 years is a huge amount of time in computer years. A tiny little thing, just a long essay, really, yet so packed with one explosive idea after another, brilliantly and beautifully written, sliding under your overconsciousness like the cutting razor edge of broken glass and stripping the carefully-pasted skin and gloss of perception off the world you see around you - smashing illusions, firing x-rays through groupthink and consensual mass delusion, laying bare the way the world actually works underneath how we think it does This. Is. Mindblowing. All with the beautifully crafted metaphor - no, example - of technological paradigm shifts. It's not about the computers, the operating systems, about technology - it's about us. And today, as we argue hysterically about PC vs Mc vs Linux, iPhone vs Android, privacy settings and identity theft, cookies and ad networks, Siri and who knows what... it's a brilliant way to step back and look at what we're really creating such a ruckus over. Sometimes I can be a complete plonker, but never more so than when I start grabbing virtual copies of books without bothering to read their descriptions. Which is how what I thought would be a little slice of sci-fi turned out to be an essay on computer operating systems. I’m far more computer-friendly than most people I know and also have a thing about always finishing what I start, but for the first time in years I couldn’t bring myself to finish this, giving no shits whatsoever about the subje Sometimes I can be a complete plonker, but never more so than when I start grabbing virtual copies of books without bothering to read their descriptions. Which is how what I thought would be a little slice of sci-fi turned out to be an essay on computer operating systems. I’m far more computer-friendly than most people I know and also have a thing about always finishing what I start, but for the first time in years I couldn’t bring myself to finish this, giving no shits whatsoever about the subject. I normally wouldn’t review a book I hadn’t finished, but as I’m currently 6 books behind schedule on my Goodreads challenge target, I’m claiming it. Dated as any ten year old book about computing is going to be, I still highly recommend this exploration of the Operating System. A great deal of the history of Microsoft and Apple has now become myth, but Stephenson breaks it down nicely as what it really is--two corporations trying to make money. His metaphors--and the idea of the operating system as a metaphor--displayed the deft mastery of writing that one expects from him as an author. His broad knowledge of computing explained how he becam Dated as any ten year old book about computing is going to be, I still highly recommend this exploration of the Operating System. A great deal of the history of Microsoft and Apple has now become myth, but Stephenson breaks it down nicely as what it really is--two corporations trying to make money. His metaphors--and the idea of the operating system as a metaphor--displayed the deft mastery of writing that one expects from him as an author. His broad knowledge of computing explained how he became such an excellent science fiction writer. And of course, his pithy little quips are worthy of any Linux programmer. The book is a very short collection of fun essays, often hilarous. Yet it is hopelessly out of date, as the computer world has moved very far since 1999. Stephenson hates both Microsoft Windows and Apple's MacOS, because they are both proprietary. He loves Linux and BeOS, because they are open-source. He also loves the command line, because of the power and precision that it gives the user. On the other hand, he realizes that the command line approach is fraught with an amazingly steep learning The book is a very short collection of fun essays, often hilarous. Yet it is hopelessly out of date, as the computer world has moved very far since 1999. Stephenson hates both Microsoft Windows and Apple's MacOS, because they are both proprietary. He loves Linux and BeOS, because they are open-source. He also loves the command line, because of the power and precision that it gives the user. On the other hand, he realizes that the command line approach is fraught with an amazingly steep learning curve, before one can become a true "power user". I feel like I just listened to my grandfather say really smart things about something he cares about for two and a half hours. Wry, philosophical, filled with big words I had fun looking up. Outdated now, and certainly opinion-driven rather than hyperfactual, but an overall entertaining and interesting little read. A beautifully written explanation of operating systems: how they work, what they do, how they do it. He also delves into the differences between Apple, Microsoft, Be, and Linux. Simple enough for me to understand and appreciate. Stephenson also goes into American culture and explains why consumers respond to these corporations/organizations as we do. Very thought provoking. Aunque un poco anticuado (se escribió en 1999), es un libro con gran cantidad de puntos de vista interesantes acerca del mundo de la informática y los sistemas operativos que te arranca más de una carcajada. Recomendable! - Neal Stephenson, "In The Beginning. . . was the Command Line"
What a fun read. It's about technology, sure, but more about culture. Neal takes a good look at operating systems, why we get emotionally involved with them, and why Windows is still so popular. He does this with a grand detour to Disneyland, and a hefty dose of humor. The above quote was from near the end of the book, where he imagines hackers creating big bangs from the command line. He starts out the book from some anecdotes from the early 1970s, when he had his first computer class in high school. His school didn't have a computer, but they did have a teletype (the physical kind that used paper) with a modem link to some university's system. But time on that system was so expensive that they couldn't just dial in and run things interactively. The teletype had a paper tape device. You'd type your commands in advance, and it would punch them out on the tape. Then when you dial in, it would replay the tape at "high speed". Neal liked this because the stuff punched out of the tape were, actually, "bits" in both the literal and the mathematical sense. This, of course, led to a scene at the end of the schoolyear where a classmate dumped the bin of bits on the teacher, and Neal witnessed megabytes falling to the floor. Although the book was written in 1999, and needs an update in some ways, it still speaks with a strong voice today -- and is now also an interesting look at what computing was like 10 years ago. That doesn't mean that Stephenson is just a Linux apologetic. He points out that the CLI has its place, and has a true love-hate relationship with the text-based config files (remember XF86Config before the days of automatic modelines? Back when you had to get out a calculator and work some things out with pencil and paper, or else risk burning out your monitor?) He points out that some people want to just have the thing work reasonably well. They don't want control -- in fact, would gladly give it up if offered something reasonably pretty and reasonably functional. Microsoft Word, were devoted to features like mail merge, and the ability to embed feature-length motion pictures in corporate memoranda, were, in the case of emacs, focused with maniacal intensity on the deceptively simple-seeming problem of editing text. If you are a professional writer--i.e., if someone else is getting paid to worry about how your words are formatted and printed--emacs outshines all other editing software in approximately the same way that the noonday sun does the stars. It is not just bigger and brighter; it simply makes everything else vanish. For page layout and printing you can use TeX: a vast corpus of typesetting lore written in C and also available on the Net for free. I love these vivid descriptions: programs secretly chatting with us, TeX being a "corpus of typesetting lore" rather than a program. Or how about this one: "Unix. . . is not so much a product as it is a painstakingly compiled oral history of the hacker subculture. It is our Gilgamesh epic." Yes, my operating system is an oral history project, thankyouverymuch. The book feels like a weird (but well-executed and well-written) cross between Douglas Adams and Cory Doctorow. Which makes is so indescribably awesome that I can't help but ending this review with a few more quotes. Because Linux is not commercial--because it is, in fact, free, as well as rather difficult to obtain, install, and operate--it does not have to maintain any pretensions as to its reliability. Consequently, it is much more reliable. what really sold me on it [Debian:] was its phenomenal bug database (http://www.debian.org/Bugs), which is a sort of interactive Doomsday Book of error, fallibility, and redemption. That should be our new slogan for bugs.debian.org: "Debian's interactive Doomsday Book of error, fallibility, and redemption." It is obvious, to everyone outside of the United States, that our arch-buzzwords, multiculturalism and diversity, are false fronts that are being used (in many cases unwittingly) to conceal a global trend to eradicate cultural differences. The basic tenet of multiculturalism (or "honoring diversity" or whatever you want to call it) is that people need to stop judging each other-to stop asserting (and, eventually, to stop believing ) that this is right and that is wrong, this true and that false, one thing ugly and another thing beautiful, that God exists and has this or that set of qualities. Apparently this actually works to some degree, for police in many lands are now complaining that local arrestees are insisting on having their Miranda rights read to them, just like perps in American TV cop shows. When it's explained to them that they are in a different country, where those rights do not exist, they become outraged. Starsky and Hutch reruns, dubbed into diverse languages, may turn out, in the long run, to be a greater force for human rights than the Declaration of Independence. I wanted to read this to learn more about Linux and I learned some, but not as much as I wanted. I didn't like Stephenson's snotty attitude about how people use computers. Neal Stephenson"s historical fiction account of the history operating systems is a good read but it is antiquated due the exponential growth of technology. Apple Inc has prospered to the growth of cellphones and the IPad,among other things. Good read! This book gives you a lot to think about. Not what I was expecting but in a good way. It is a bit old and i would love to see his take on computer systems today. A NS le han encuadrado siempre en la literatura “ciberpunk”, que vaya usted a saber lo que es. NS es, en mi humilde opinión, un tipo que escribe de puta madre sobre cualquier tema, y especialmente sobre aquellos que tengan que ver con la tecnología en general y los ordenadores en particular. La edición que he leído es el original inglés, pero el libro está traducido al español y, lo que es aún mejor, se puede leer gratis en la Red. Se trata de un ensayo sobre los sistemas operativos (Dios mío, si A NS le han encuadrado siempre en la literatura “ciberpunk”, que vaya usted a saber lo que es. NS es, en mi humilde opinión, un tipo que escribe de puta madre sobre cualquier tema, y especialmente sobre aquellos que tengan que ver con la tecnología en general y los ordenadores en particular. La edición que he leído es el original inglés, pero el libro está traducido al español y, lo que es aún mejor, se puede leer gratis en la Red. Se trata de un ensayo sobre los sistemas operativos (Dios mío, si alguien todavía pensaba que yo no era un geek, acabo de espantarle), en el que el autor los analiza y filosofa acerca de por qué buscamos, cada vez más, interfaces gráficas para los ordenadores en lugar de la antigua línea de comandos. La exposición está salpicada de anécdotas personales y de críticas y alabanzas a las principales empresas informáticas (pista: Micro$oft no se lleva alabanzas). Es en este libro donde escribe NS su famosa analogía (al menos yo la había oído dos veces) entre sistemas operativos y coches: Windows es un monovolumen familiar, grande, pesado, que consume mucho, que de vez en cuando se queda parado en mitad de la autopista sin razon aparente, que cuesta mucho dinero, que tiene mil millones de fallos que los fabricantes no consiguen eliminar en sucesivas versiones, y que conduce el 90% de la gente. Macintosh vende lujosos sedanes europeos, que les dan mil vueltas a los gonomolúmenes de Microsoft, pero no se les puede abrir el capó. Todo es secreto. BeOS fabrica Batmóviles, rápidos, con prestaciones increíbles. Y Linux es un puñado de hippies que regalan tanques que ellos mismos fabrican en sus ratos libres, mucho más rápidos, muchísimo más resistentes, infinitamente más eficaces que Windows y además gratis, pero nadie (o casi nadie) les hace caso.